With amazing weather all year round, the warm Indian Ocean, great schools, free-flowing traffic and excellent value for money in the property market, Durban boasts a lifestyle like no other. As a Durban-based company, we might be accused of being slightly biased in the way we view our city, but now an authoritative study has confirmed (again) what we’ve long suspected - Durban is South Africa's best city to live in. Mercer’s 20th annual Quality of Living Ranking has rated Durban (89) the South African city with the highest quality of living. Other South African cities to make the top 100 are Cape Town (94) and Johannesburg (95). Durban was also rated Africa’s second-best city to live in, behind the Mauritian city of Port Louis (83). At the other end of the scale, N’Djamena (226), Khartoum (227) and Bangui (230) were the lowest ranked in the African region. Persistent political instability, poverty, extreme climates and lack of appropriate infrastructure investments means these cities have the lowest quality of living worldwide. Globally, the top 10 list is dominated by cities in Europe, despite political and economic volatility caused by Brexit. 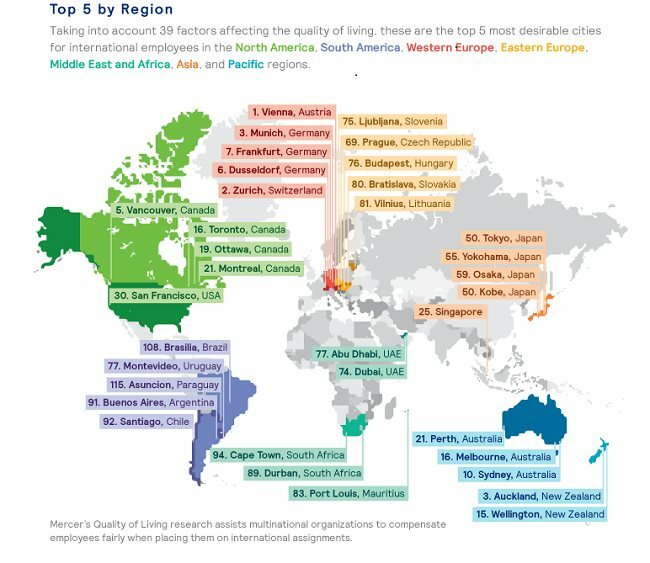 However, Mercer points out that cities in emerging markets like ours, though challenged by economic and political turmoil , are catching up with top ranking cities following decades of investing in infrastructure, recreational facilities and housing in order to attract talent and multinational businesses. • Housing (rental housing, household appliances, furniture, maintenance services). • Natural environment (climate, record of natural disasters).